While getting the Christopher-Jin ready for this season I discovered that the fore deck was starting to turn blue...as was I. The above picture was taken after sanding so the trouble looks even worse than it was at the start. This was going to be another first for the Christopher-Jin and I. We were going to have to refurbish a deck. The Interlux System is a multi-step process that appears to be pretty labor intensive but the way a lot of folks seem to go. As I read on I found KiwiGrip to be an alternative that became available in the last 15 years. According to articles that I've read, KiwiGrip was developed in Australia and is used in Australia and New Zealand and the reviews are good. 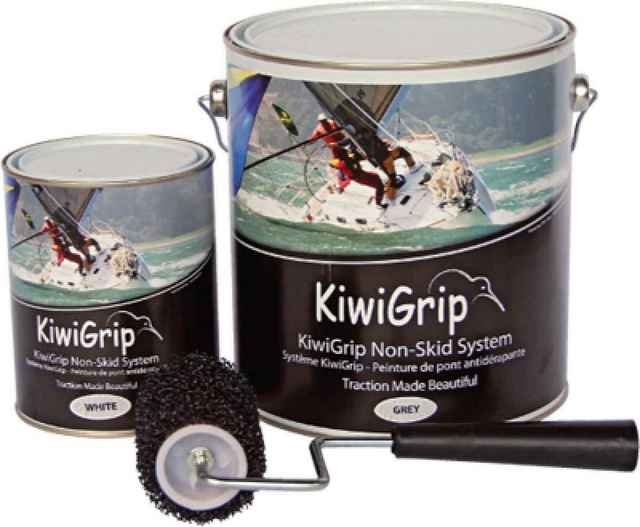 KiwiGrip is a water-based product, that is painted on. It sounded good so I decided to give it a try. I've modified the procedure slightly from the article cited above and have show what I did below. We suggest you work in a shaded area if possible. We had a warm and mostly cloudy day but when the sun came out the KiwiGrip began to set up faster. 1. Prep: Wash the deck and let dry. Sand the areas to be covered with a random orbital sander and 80 grit sand paper. (Wear a fiber glass rated dust mask!) Wash down the deck again and let dry. Take your time with this step. Using 3M Blue 7 Day Rated masking tape, (It has a little more stick but must be removed before 7 days.) mask off the area. I taped around stanchion posts, a pad-eye and other fixtures. Then use various size paint cans and lids to trace professional looking curves into the masking. 3. Application: KiwiGrip is very thick. I applied it with a cheap throw-away three inch brush and then used a grooved plastic spreader to distribute it evenly. Next you use the KiwiGrip textured roller to emboss a non-skid texture into the surface. The rollers come in two sizes. I bought two four inch rollers and one nine inch roller. The four inch roller did the trick. You want to roll in one direction only and keep the pressure light to avoid spreading the KiwiGrip out too thin. Roll either towards or away from you, lift the roller off the surface move it back to the start, move over a little, set the roller back on the deck and roll again in the same direction. The job of spreading the KiwiGrip is done by the grooved plastic spreader. The roller's job is strictly to create texture. Rolling immediately after spreading will create a lower profile texture. Rolling later will create a much rougher texture. I suggest working about two square feet at a time. Also note that you will not be able to get the texture roller into tight spaces so we used a 1-1/2 inch throw-away brush to stipple in a texture in those tight spaces. 4. Finishing: As soon as the surface sets up you can remove the masking tape. Don't wait until the KiwiGrip is completely dry or you will have trouble removing the tape. Allow to dry for at least 24 hours before walking on. KiwiGrip comes in a variety of colors and costs $45 a quart. The rollers are about $5 for the four inch and $9 for the 9 inch. The job goes faster and easier if you work with a partner. I dragged MOMM (Me-Ol-Mate-Mark) out of hiding to give me a hand. MOMM is seen elsewhere on this website auditioning for the Blue-Man-Group (also know as bottom paint sanding!). 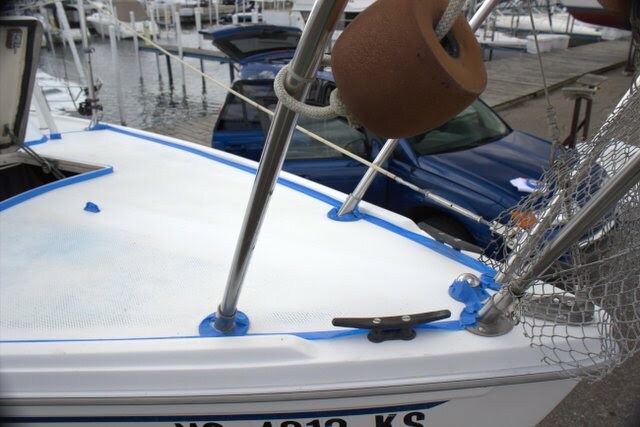 The foredeck and hatch took about 1/2 qt. I checked on the finished job 24 hours later and it's looking good and solid. While lifting the masking tape the day before a couple of corners started to lift. I pressed them back down and they seem to have stuck. We'll be keeping an eye on those spots to see if they come back up over time. I used white and the color match is excellent with the rest of the deck. 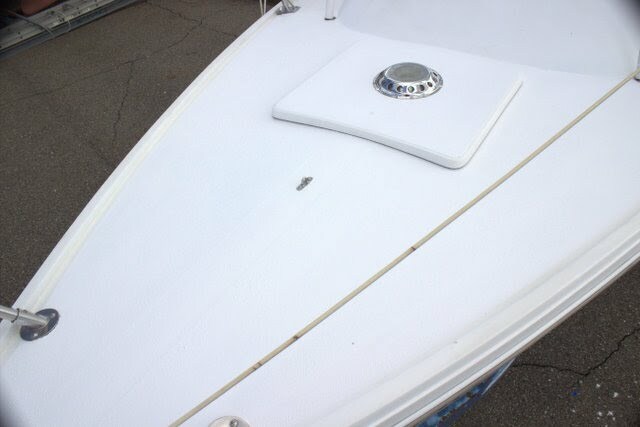 I want to resurface the cockpit deck but want to wait to see how the foredeck holds up.